A Day In Healdsburg – Good to the Last Drop! We spent the last day of our trip in Healdsburg. I love this town for a lot of different reasons. The town square is wonderful for dining, shopping and entertainment. Healdsburg is also centrally located to over 100 wineries! What’s not to love! After breakfast at the Vintner’s Inn we headed to J Vineyard & Winery. Sunset Magazine named J Vineyard & Winery the “Best Tasting Room in the West!” The vineyard was founded in 1986 by Judy Jordan (yes, the famous Jordan name). The winery began as a producer of sparkling wine. Now they feature Pinot Gris, Chardonnay and Pinot Noir in addition to sparkling wine. The facility is beautiful and they serve a full lunch if you are hungry. We opted just for the tasting since we had other plans for lunch. WOW! We are their newest fans. It didn’t take us long to decide that this was our favorite new winery and we had a case of wine shipped back to enjoy. For lunch we visited one of our favorite stops, Oakville Grocery Co. The location in Healdsburg is located right on the historic square. It is a great place to pick up picnic supplies or have them make you one of their fantastic sandwiches and dine on their patio. It is always on our “To Do List” when we are in the area. Their original location is in Oakville on the Napa Valley side. We had a 3:00 pm reservation for a tasting appointment at Jordan Vineyard and Winery. I was very excited about this tasting as we have been a fan of Jordan for years. They do require reservations and they only have 12 people per tasting so it is a very enjoyable way to spend an hour. Claire Holloway with Jordan was our host for the tasting and she was extremely knowledgeable about the Jordan history and their wines. We started the tasting with their Chardonnay in the library and it was very good. I have always known Jordan for their Cabernet Sauvignon so the Chardonnay was a nice surprise. We then moved through a secret passage way to an adjoining room for the Cab tasting. They poured three different Cabernet vintages and we really enjoyed all of them to the last drop! As you can see in the picture above, they offered a food pairing with the tasting that was perfect. We took a few bottles with us and also plan to order a bottle of their olive oil that we tried with the food pairing. After taking lots of pictures of the beautiful estate of Jordan, we decided to drive over to White Oak Vineyards & Winery. We are in their wine club but haven’t visited in about five years. We were the only ones at the winery since it was so late on Sunday but it was a fun way to end our trip. 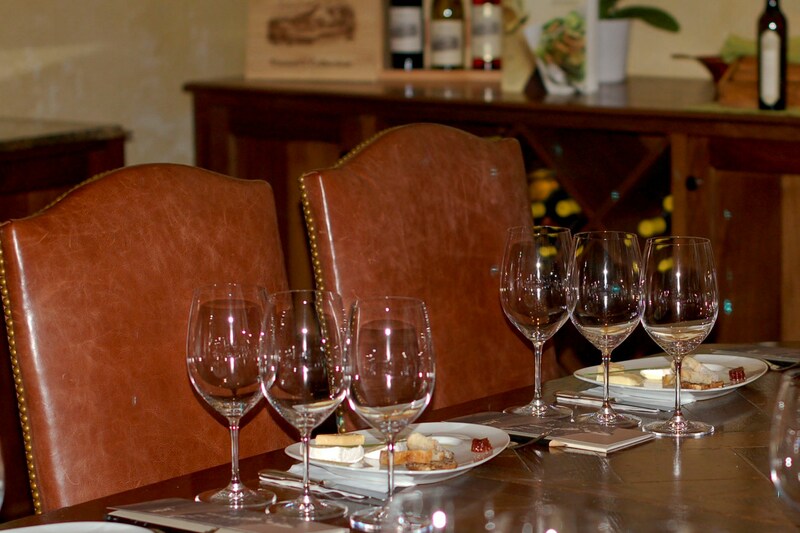 They have a great tasting room and a lot of great tasting reasonably priced wines ranging from $16 – $50. Our dinner reservations that night were at Scopa in Healdsburg. We definitely saved the best for last. Scopa is a fun intimate restaurant with some of the best Italian food we have ever had. We were so lucky to get a reservation…Make sure you call early in the week to get in for the weekend. I had the grilled peach salad followed by the spaghettini with a braised short rib meat sauce. “Amazing” is the best word I can use to describe this meal. Mr. 25th Hour had a cremini mushroom salad as his starter and then the veal Bolognese over tagliatellle pasta I typically can’t finish a pasta dish but I was determined to not let a forkful go to waste. The service was energetic and perfect for the restaurant. We had a wonderful trip and we can’t wait to plan our next adventure!